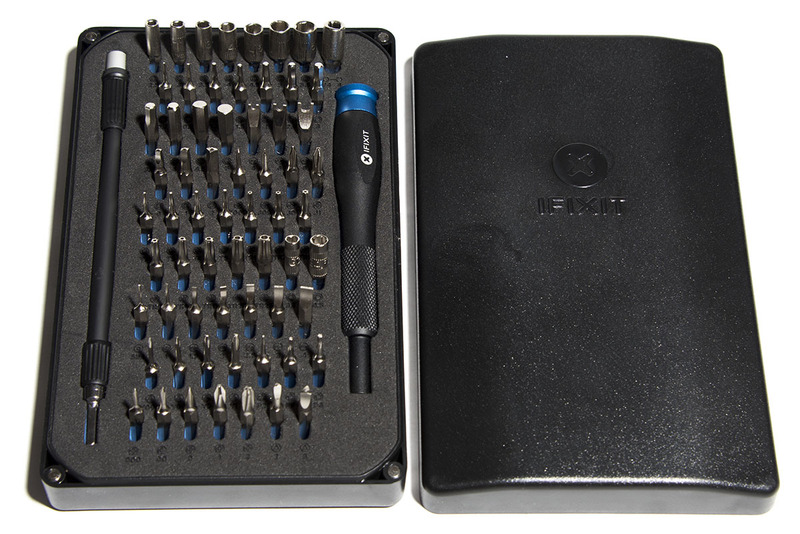 I’ve been in need of a “real” toolkit for a while now, something with all the specialized screwdrivers and odds and ends needed to take apart most modern computers, phones, and other assorted gizmos. 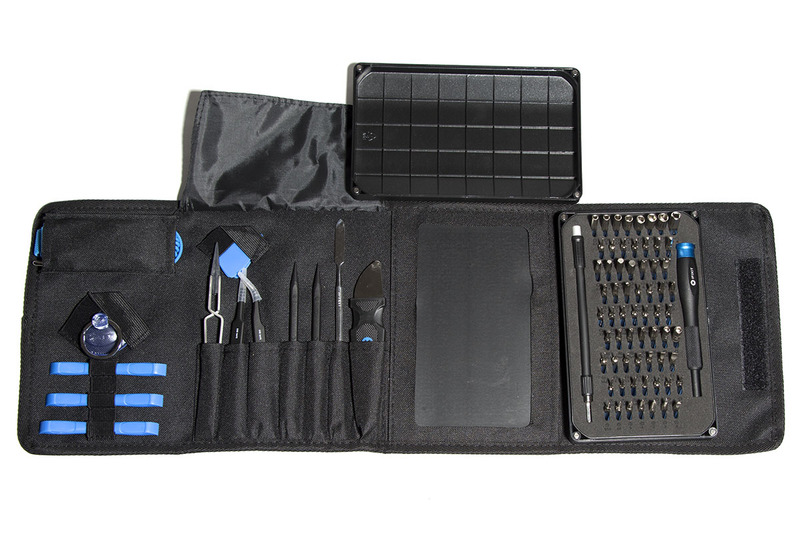 When I stumbled on the new for 2016 iFixit Pro Tech Toolkit, it looked like a good option, and I’ve heard a lot of good things about them, so I decided to pull the trigger on ordering one. 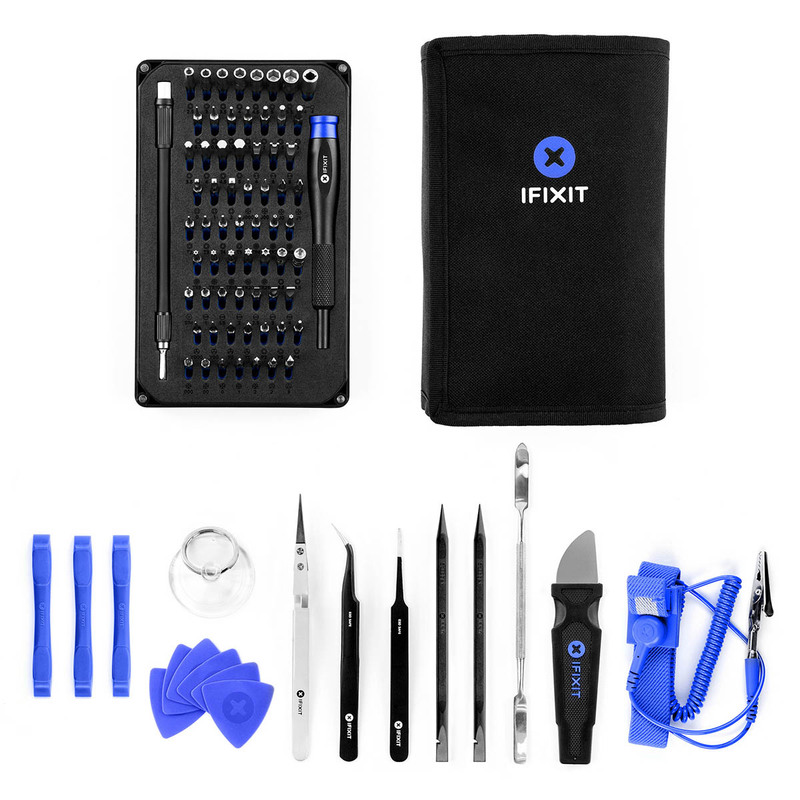 The iFixit Pro Tech Toolkit includes a 64 bit driver kit, anti-static wrist strap, a suction cup, 3 opening tools, 6 opening picks, Nylon tipped reverse tweezers, angled ESD tweezers, blunt ESD tweezers, 2 spudgers (type of prying tool), a metal spudger, a jimmy, a magnetic pad, and it’s all wrapped in a tool roll to keep it all nicely together. Another really nice feature of the Pro Toolkit is that the container that holds all of the driver bits is held into the kit by a magnetic pad. So you can remove the drivers and take them out separate, and have a magnetic pad to set screws so they don’t get knocked off your work bench. Along with that, the top of the driver kit is plastic with small grid lines so you can easily compartmentalize small items. All nice organizational for when you are taking apart things with lots of screws or different size screws. I’ve used the tools for a couple of small projects so far, but in general the screwdriver is well made, and quite nice. I think the driver set is definitely the shining point of the kit. It gives you a decent grip for tight screws and it just in general works well (though, I’ve still had a few screws that I ended up having to use a “real” screwdriver for). 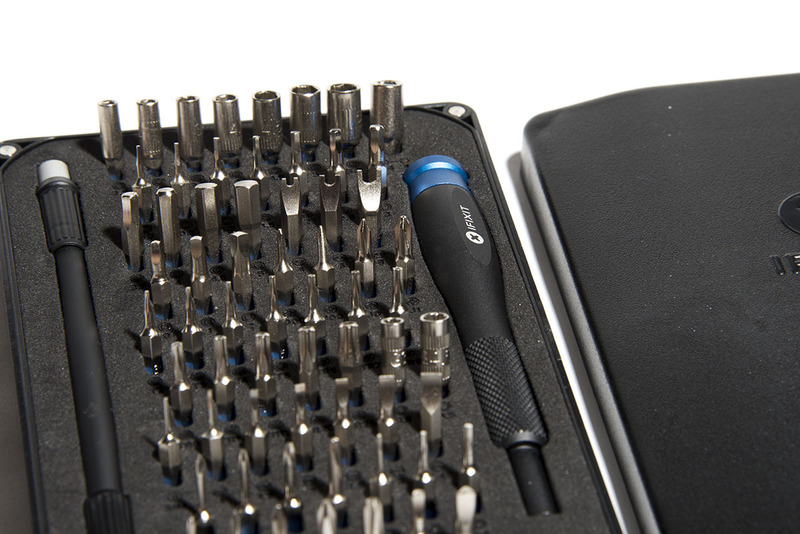 Much better than generic jewelers screwdrivers. One thing to definitely note about the bits is they are not made of the hardest material, or of an “industrial” quality. Using one of the Philips head bits to remove some screws that were REALLY tight caused some minor damage to the bit. It’s not bad enough to cause issues, but you can see where the metal dented a bit. Also some items you will appreciate, especially if you’ve ever tried to pry open a laptop with a screwdriver, is all of the plastic prying tools, spudgers, and opening picks. They will keep you from destroying plastic cases and screens, etc. They are a little softer than I would probably like, but, to be expected with plastic tools. Just know you’re not going to use them to pry apart a glued together case without damaging some of the tools (you need metal, or something that was put together with really bad glue). There are a couple of little things that I think are missing from the toolkit. The main thing being a pair of wire cutters, something simple and small for snipping zip ties, or the occasional wire. Something like these, or these. They may have added too much bulk to the kit, but, something like that being included would really round out the kit. Another thing that would be nice to see, is maybe some small hook and loop enclosed pockets on the outside or inside of one of the flaps of the case. Something where you could neatly store some small zip ties, or electrical tape or something… And maybe a small hook on the side of the case to clip on additional items. All really small things, that probably would have pushed the price point up, but, would really round out the kit. Other than those couple of items, that are not really essential to “most” computer work, the kit has pretty much everything you will need, within reason.